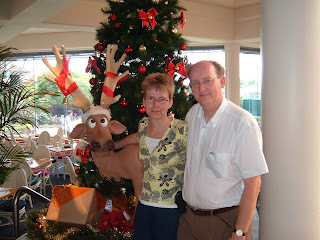 Dave & Inge Down Under: Merry Xmas and a Happy New Year! Its Christmas eve and the daytime temperature is a nice and warm 29C with 32C predicted for Chrismas day...lovely! Tomorrow our Christmas meal will be for dave a not typical seafood feast with local prawns and fettucini. 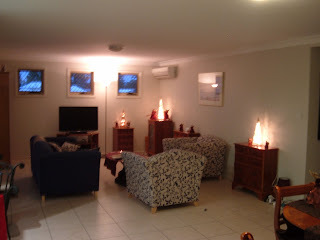 The living room is decked out with lighted christmas trees and looks very nice at night. In the weekend we will probably take a day trip to Byron Bay which is a 2hr drive south along the coast, it seems Byron Bay is a bit of a 'new age' spot, a report will follow. We wish everyone a fine and festive Christmas and our best wishes for 2009!! !